« A Room With A View. Yesterday evening, I went to the dog run with Topsy. As we walked down the hill towards the lake, I was knocked to the ground by one of a pair of Irish wolfhounds that must have been doing about 30 mph (50 kph). I’ve injured my knee so painfully that I can barely walk, and I spent today in bed. The wolfhounds were bigger than a Shetland pony, probably four or five feet (1200-1500mm) tall at the withers. It had no trouble in flattening me. In fact, it was so intent on pursuing another, smaller dog that it probably didn’t even notice as I went down. Even after I’d hit the ground with a cry it went charging along like a freight train. No thought of an apology or a dusting down of the frail old codger. Enormous bodies and appetites, Irish wolfhounds, teeny-weeny brains. In typical Norwegian fashion one of the ten-or-so onlookers asked me which of the Irish wolfhounds was to blame, the small one or the big one? “The big one”, I said. They both looked about the same size, actually. “Oh no,” he said, “it was most probably the smaller one.” “So why did you ask?” I said, like I wanted to stop for a dog-spotting lesson. As I limped back up the hill and homeward the woman who appeared to be the owner of the dogs asked me if my knee still hurt. “Yes, it does,” I said, thinking that on Monday, if this were the USA, I’d probably be suing her for several million dollars. Next time we go to the dog run I’m wearing cricket pads and a motorbike helmet. D’ye get many wolves around your place? D’ye fall a lot, lately? Just kidding. I hope your knee is better now. Julia: You laugh, but your turn will come sooner than you think. Crown: If you do sue her, I hope you use that photo as evidence. It needs a little more work, though. What a monster dog! I can’t understand people wanting such giant animals in their houses. Arnica should be good for what ails your knee. Arnica, thank you m-l. Easy to remember the name, the near homophone aner ikke means the Norwegian equivalent of “haven’t a clue”. And likewise on the giant dogs, small ones are just as much fun. Julia, it was so peculiar to see you breaking out into a Scotish dialect. I hadn’t yet seen dearie’s so I didn’t know what was happening. Sorry about the sciatica. Dearie, There are wolves, though there are the inevitable people doing their best to stamp them out ’cause they’re “dangerous”, but I think I’m right that there are no longer wolves in Ireland. Ø, I ought to make the figure darker, don’t you think? Oh well, I’ll never get any money off her in Norway anyway. I’ve always thought that big dogs are more fun than small ones, but this is really just a prejudice on my part. WiPe told me that the last wolf in Ireland was supposedly killed in 1786, with the help of some wolfhounds. The thing about the photo is that it has a slightly Escher-staircase quality. You are angled in such a way that your feet are distinctly further from the viewer than your head is, while the dog is more nearly in profile; yet look at where his hind feet are relative to yours. Yes, great analysis. The figure only fits because it’s foreshortened (the feet are way too small compared to the dog’s). I should’ve used a different man. It was assembled in haste. Poor Mr Crown. I had a 50-kilo lab run at full speed and bash into the back of my (bad) knee this winter. Hurt like hell. You have all my sympathy. BTW, Riley’s dacha best friend is a young Rhodesian Ridgeback. She lopes along like an antelope and runs like the wind. She is incredibly sweet-natured, but the dumbest dog I’ve ever met. I think her breed takes down lions. So maybe all these massive hunting dogs are bred for brawn and not brain? Someone who has experienced the same thing! Sorry to hear it. Those Rhodesian Ridgebacks: they have them here, but I always feel a bit incorrect liking them – though I do. Oughtn’t they to be Zimbabwean Ridgebacks by now? One of the Irish wolfhounds, I think it’s the male, though enormous in the side-view is incredibly thin; so from head-on it looks 2-dimensional, like a paper tiger. As I limped along, I felt rather silly saying that I’d been ambushed by a labrador. 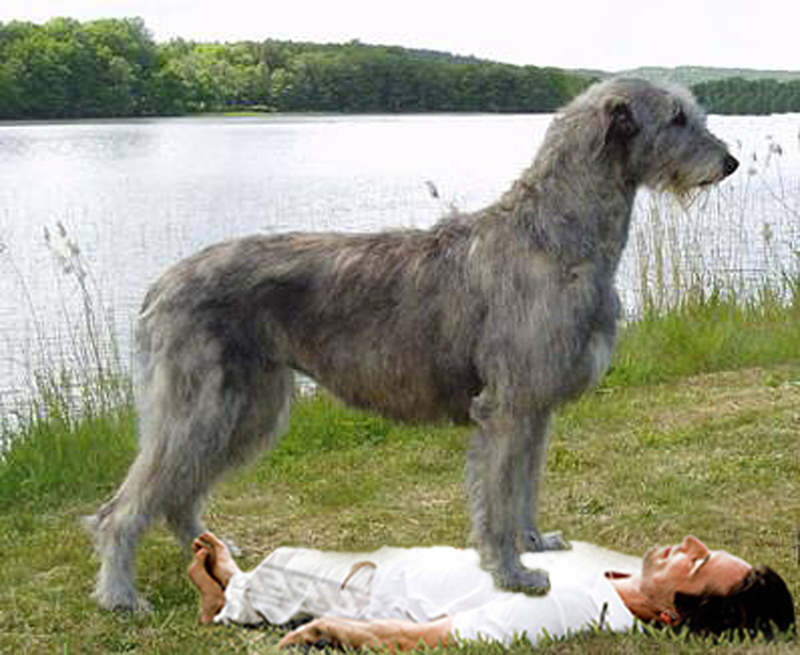 At least an Irish Wolfhound sound impressive. Have you ever seen a borzoi? They also look two-dimensional, and they have the oddest long snouts. Ridgebacks are lovely animals, and the one out here is incredibly sweet. Other Ridgebacks in the park — not so much. Apparently hard to train. On the other hand, if they saw a lion, they’d take it down in a second. Hey, the dog and the underdog both disappeared. Oh, they’re back. What just happened? They get two-minutes’ break every four hours; it’s some sort of union thing. mab, you should check out this video of a pride of lions getting beaten up (no one gets hurt) by Cape buffalo. At least an Irish Wolfhound sound impressive. I forgot to say… to me, being run over and injured by a Rhodesian Ridgeback sounds like you’ve been playing international rugby. That’s quite impressive. Next time take a bodyguard with you. When we lived on a boat in Paris, we used to see a woman taking her Great Dane for a walk along the quayside. She crawled her Mercedes convertible along with the dog on a leash trotting beside her – and he was much taller than the car. Living on a boat, huh. One of our dogs will soon be old enough to apply for a driving licence.